Along this park are many mulberry trees, plum trees, apple trees, and fortresses of blackberry bushes. It makes me wonder why we don’t plant fruit trees in our parks anymore. I can just imagine what it was like fifty or more years ago walking along the river, knowing you could stop for a snack of fresh fruit anytime you wanted. What a remarkable legacy to leave behind. Jesse and I picked a napkin full of mulberries to make this salad before heading home. I look forward to going back when the plums are ready. 1. Preheat the oven to 400 degrees. Line a rimmed baking sheet with foil. 2. Cut off the beet stocks and roots and scrub well under water to clean. Pat dry and rub the beats with olive oil and sprinkle with salt. Place on the baking sheet and cook for 50-60 minutes until easily pierced with a knife. Cool, peel, and slice beets. 3. Toast the walnuts in a bowl in 30 second increments on high until toasted and fragrant. Chop into large pieces. 4. Chop spinach or use baby spinach and arrange on individual plates. 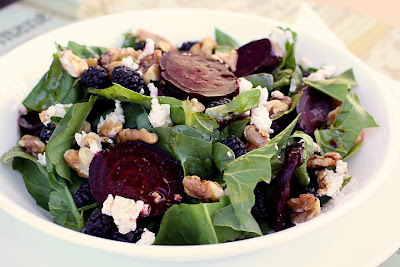 Top with sliced beets, some crumbled goat cheese, walnuts, and mulberries. 5. Shake together vinegar and oil. Drizzle a little over salads. Then sprinkle salad with salt and freshly cracked pepper. Serve immediately. Lol I know I am bad. I just can't help it. You're suppose to ask what they are first, then sample the find! Aren't mulberries real sweet? We have them all over the farm, but I haven't ventured there yet( I've only lived here 32 years). The salad looks delich... I haven't done the pizza yet, still going to do that! Oooh, I love roasting beets. Have you ever tried the golden beets? They're so pretty in salads. Erin, no I haven't gotten my hands on any. Ever! Do you know where to find them? Lol ok other than someone else's garden. One of these days I'm going to get in trouble! I like this salad. Beets? Fuzzy texture. Can't do 'em. Ice cream, anyone? After the salad, of course. What lovely colors. I love roasted beets so any recipe containing them is heaven for me. Laura- I've never been a fan of beets, but this recipe makes me want to give them another try! Looks amazing. We have two mulberry trees and never get to eat any because of the squirrels. Like Sherri, I'm not a fan of beets, but don't mind them raw. They taste a bit like carrots. I'd be tempted to substitute grated raw beets, but since I am losing the mulberry war, the point is likely moot. This looks gorgeous! Perfect combos! I wouldn't know a mulberry if I tripped over one! I HATED beets until I had them in a salad very similar to this. The combination of beets, goat cheese, and candied pecans made me a beet lover:) Beautiful salad. One of my "go-to" summer dishes. Laura- in response to your question back at my site, I have no update on Tyson. I should find something out by Monday. This sounds like an amazing salad - so many interesting and tasty ingredients working together here! This is one of my "I love it salads" even without the mulberries. How nice that you found them, however:) I loved for you to join us in Crock Pot Wednesdays on diningwithdebbie.blogspot.com. It's going to be fun and there are some awesome prizes for this inaugural event. Come check it out and sign up with Mister Linky. Beets in a salad is one of my favorites. the mulberries makes it even more interesting. The earrings will be in the mail this week since I just got home yesterday. I found you through the google reader top recommendations (way cool!!) hope you don't mind if I stick around for a bit. Beautiful salad. Wow cool Danielle! I am so glad you are here. This looks wonderful. I would say... don't eat the berries! They might be poison. LOL! But you threw caution to the wind and were lucky. I love the name of your blog. I take photos of the food I cook and blog about it too. It is fun! Lovely photo, delicious salad. What to say more...? The salad looks delicious! I love beets! I have never heard of a mulberry....except for the mulberry tree and I only used the leaves to feed the silkworms!